There are several million cases of strep-related diseases including impetigo each year, according to the Centers for Disease Control and Prevention. Most of these cases occur in children, which may make it difficult for active youngsters who are told they can't go swimming or pursue other activities during an outbreak. But doctors and government health experts believe that in order to contain this contagious disease, it may be necessary to keep impetigo patients away from public areas like pools. There are three types of impetigo, a highly contagious bacterial skin infection. Impetigo contagiosa, the most common, starts as a red sore on your child's face, which ruptures an oozes fluid or pus, and may be accompanied by swollen lymph nodes. Bullous impetigo often occurs in young children and causes painless, fluid-filled blisters on the trunk, arms and legs. Ecthyma is the most serious form, penetrating deeper into the skin's second layer, and causing painful sores that turn into deep ulcers on legs and feet. Most cases of impetigo clear up in two to three weeks, without medications, although your pediatrician may prescribe antibiotics to keep the condition from developing complications. Impetigo is extremely contagious while the sores on your child are draining and oozing. You'll need to decontaminate everything the child touches including clothing, linens and towels. This is one of the main reasons doctors recommend against children swimming during an active impetigo outbreak, as they can easily infect other children who may come into contact with the swimsuit, towels or skin of an infected youngster. A child who isn't on antibiotics will need to refrain from swimming until the sores are gone, whereas a child on antibiotics is usually no longer infectious within 24 hours of beginning antibiotic therapy, something that may be helpful if your family has a summer vacation to the beach or pool coming up. In general, you don't catch impetigo from water, particularly the ocean or water that is heavily chlorinated. Pool chemicals can kill bacteria, but if the levels of chemicals are low or inadequate, the risk of infection could be increased. 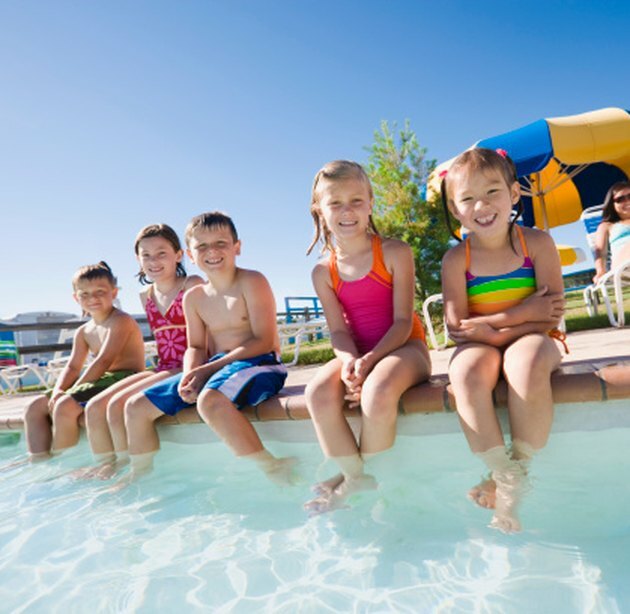 Children catch impetigo from direct contact with pool surfaces, pool and patio furniture, clothing, pool or beach toys or any other items that may have come in contact, directly or indirectly, with a child's sores. Impetigo usually isn't dangerous, but it can lead to rare and serious complications. These include kidney inflammation and ultimately kidney failure; an infection affecting the tissues underlying the skin, called cellulitis; or Methicillin-resistant Staphylococcus aureus, the infection known as MRSA, which is resistant to most antibiotics. This is another reason why it's so important to keep a child infected with impetigo away from public areas like swimming pools until the condition is under control and no longer contagious.